The last ten years has seen China’s influence increase markedly across Central Asia, below I provide a snapshot of its activities in each state in this formerly Russian dominated region. This insular post-Soviet relic stands in the middle of a regional struggle for gas supplies of which the country has in abundance. A new pipeline to China has pulled the economy away from Russia’s orbit, which previously had a monopoly on the distribution of Turkmen gas which went via Soviet era pipelines North, before being sold on to Europe. Now India is discussing its own pipeline through Pakistan and Afghanistan, the obvious dangers of such a route underline the fact that the country faces a massive energy shortfall in the coming decade. There is also a pipeline going south to Iran, giving Tehran an interest in the country. The dominance of gas and the dictatorial, socialist flavour of the Ashgabat regime has meant other foreign investment is crowded out, save a few hardy Turkish entrepreneurs. The Central Asian giant has skilfully balanced political relations with Moscow and Beijing, drawing closer to China through energy exports and trade, but at the same time joining the Eurasian Union, a Russian backed trade agreement. The President Nazarbayev also moved the capital to Astana, moving away from Almaty, which is located next to the Chinese border, in part to be closer to Moscow. Kazakhstan produces gas and oil in abundance and the recent opening of the Kashgar field has strengthened their hand in this regard, making it one of the world’s leading hydrocarbon exporters with much of this destined for China. This country is in a classic geo-political bind, a tiny population and economy with a large land mass, but small in comparison to its giant neighbours China and Russia. As a result the Mongolian government makes strong efforts to seek alliances with other nearby countries such as Japan, India and Korea in order to create balance in its political and economic relations. The opening of the huge Oyu Tolgoi mine of copper and gold threatens to make the country over dependent on China, as the demand from its industries was the reason for the opening of the mine. The mine will also create great wealth, but only for some of the population, so there is a danger that growing inequality will threaten the country’s young democracy. Under the hard-line regime of Islam Karimov, Tashkent has led an isolationist foreign policy, alienating the West and Russia to varying degrees thanks to humans rights concerns and a desire to throw off Russian influence. The country has drifted closer to China thanks to growing economic ties, Uzbek gas, cotton and minerals are eagerly snapped by China, while in other direction, cheap Chinese consumables are highly popular. A major topic of concern for China is the Uighur separatist movement in Xinjiang, China has impressed upon the Uzbek authorities that any separatist activity in the country should be quashed as much as possible, which seems to be an amenable message for this security minded government. 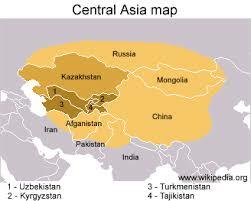 The poorest of the Central Asian ‘Stans, the country lacks the natural resources of its neighbours and the state has found it torn between its historic and linguistic ties with Russia and the commercial allure of China which offers cheap manufactured goods and generous aid programs. The country has developed strong ties with China as the Turkmen gas pipeline traverses the mountainous country’s terrain, the pipeline should prove to be an important hard currency earner for the cash strapped nation, which has only gold and hydropower to export.